I got addicted to cozies several summers ago. I think I read Victoria Laurie first, and then because I enjoyed her series so much, I used Amazon to give me suggestions. I bought Denise’s first book and read it in a few hours and knew I had to have all of the other ones! I read LOTS of other cozy series. 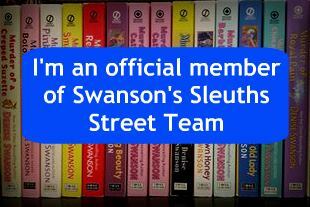 I am not a member of any other street team. I think this a great way to bring exposure to great authors! I absolutely cannot pick a favorite. Each book has something unforgettable about it. I have read both Dime Store mysteries and enjoyed them. Right now I do prefer the Scumble River mysteries I guess because there are so many in that series that it just feels comfortable when I read them. I would love to be friends with Skye! I am a high school English teacher and our lives seem so parallel at times!